This year in Yosemite is special. A lot of water and floods. Usually moonbows are more intense during snowmelt in May. This year because of late spring and rainfalls in May, snowmelt reached maximum in June. Waterfalls are still abundant in July by the way. 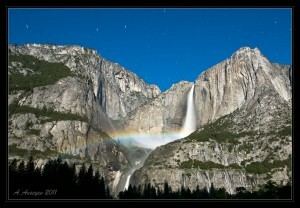 Here’s my attempt to reshoot moonbow in 2001. Waterfall was very strong, you can tell that from the picture. I have not seen bow that long in other pictures actually.